The V-1 and much larger V-2 rockets added a terrifying extra dimension to the Second World War. Once launched there was little that could stop the V-1s and nothing to prevent the V-2s from reaching their targets. Both were indiscriminate and struck with little or no warning. Their destructive power was awesome but it was their psychological impact on the defenseless civil population that posed su… ch a threat to morale.This remarkable book tells, through words and images, the story of the Allied discovery, understanding and campaign against the Vengeance weapons. 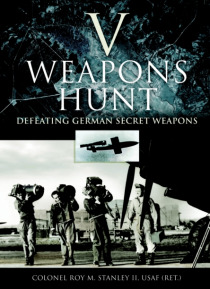 Written by a trained intelligence analyst and aerial photo interpreter, V Weapons Hunt picks out the air photographs that found the breakthrough in this vital campaign. The reader sees the first sighting of a V-1 flying bomb at the Peenemunde research facility, weapon launch sites, production facilities as well as the damage caused by Allied raids.This is a scholarly and authoritative work which lifts the lid on how Allied intelligence provided the information to defeat this insidious threat before it caused not only massive destruction but the delay of the Normandy invasion.